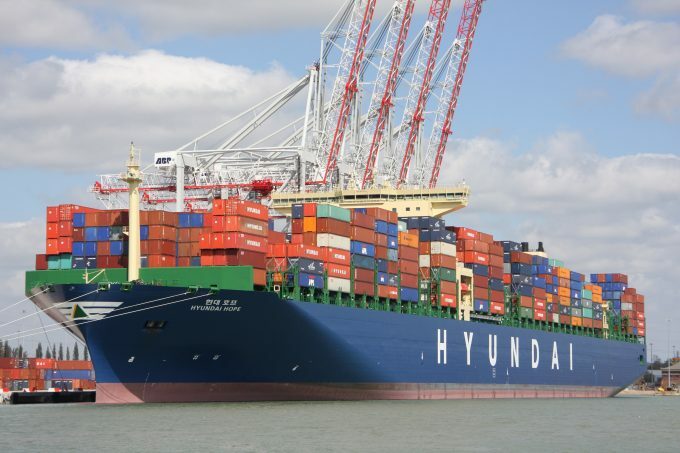 South Korea’s largest surviving ocean carrier, Hyundai Merchant Marine (HMM), has now officially confirmed its plans to order 350,000 teu of new capacity, including 12 x 20,000 + teu ultra-large vessels. In a bullish statement today HMM said that the order of the 12 ULCVs together with eight 14,000 teu ships was part of its strategy to build a fleet of 1m teu. Currently HMM is the 12th largest container line with a fleet of around 340,000 teu, if it were to increase its capacity to 1m teu it would become the 7th biggest carrier, just behind Evergreen. “HMM – as Korea’s national flagship carrier is now getting into its stride to gain global competitiveness through ordering eco-friendly and highly efficient mega containerships,” said the statement. It said it would deploy the ULCVs between Asia and North Europe and the 14,000 teu ships on the transpacific to the US east coast. According to industry sources HMM today sent out an RFP (request for proposal) to South Korea’s two biggest yards, Hyundai Heavy Industries (HHI) and Daewoo Shipbuilding & Marine Engineering (DSME), in a deal that could be worth around $3bn. The funds for the newbuilds will come from the scheme launched by the South Korean government’s Ministry of Ocean and Fisheries in the wake of the collapse of Hanjin Shipping in August 2016. Established as the Korea Maritime Promotion Corporation (KMPC) with an initial capital of $4.5bn its role is to support the nation’s ailing shipping industry which saw its reputation shattered by the sudden bankruptcy of Hanjin, then the world’s 7th largest carrier. And by making funds available for new ships, the KMPC is also propping up South Korea’s embattled ship builders which have seen newbuild orders lost to Chinese state-owned yards. HMM said that after selecting the shipyard – or yards – an LOI (letter of intent) would be signed for delivery beginning 2020. It noted that the timing of the receipt of the newbuilds would coincide with the new IMO 0.5% sulphur regulations coming into force on 1 January 2020 and in this respect it will either opt for the ships to be equipped with exhaust gas cleaning systems (scrubbers), or to be able to be powered by LNG. If scrubbers are fitted it would enable the vessels to use heavy fuel oil (HFO), which is currently around 60% cheaper than low-sulphur MGO (marine gas oil) and would thus give the HMM ULCVs a competitive cost advantage over rivals that decide to burn low-sulphur fuel. If HMM decides to run its new ships on LNG, although the gas is roughly the same price as HFO, the vessels would be more expensive to construct and the cargo capacity would be cut by some 500 teu to make space for the larger LNG fuel tanks. The delivery of the new ULCVs would also coincide with the end of HMM’s slot charter contract with the 2M partners Maersk Line and MSC. It is currently thought unlikely that the 2M would invite HMM to join its alliance as a vessel provider when the contract expires, and industry speculation is that the South Korean carrier will join THE Alliance. This week HMM launched a standalone Asia-North Europe loop, outside of the 2M, deploying 10 4,600 teu panamax vessels offering faster transit times than its competitors. In 2017 the restructured carrier suffered a net loss of $1.1bn.